Lovely apartment close to The Little Mermaid, parks and the harbor area. Close to downtown and shopping with easy access. The area has beaches, a harbor and one of the largest parks in the city, Fælledparken with jogging lanes and activity areas. The Little Mermaid is within walking distance. In the summer, you can take a dip at Svanemølle beach. A cozy 70 sq.m. apartment with large private terrace. 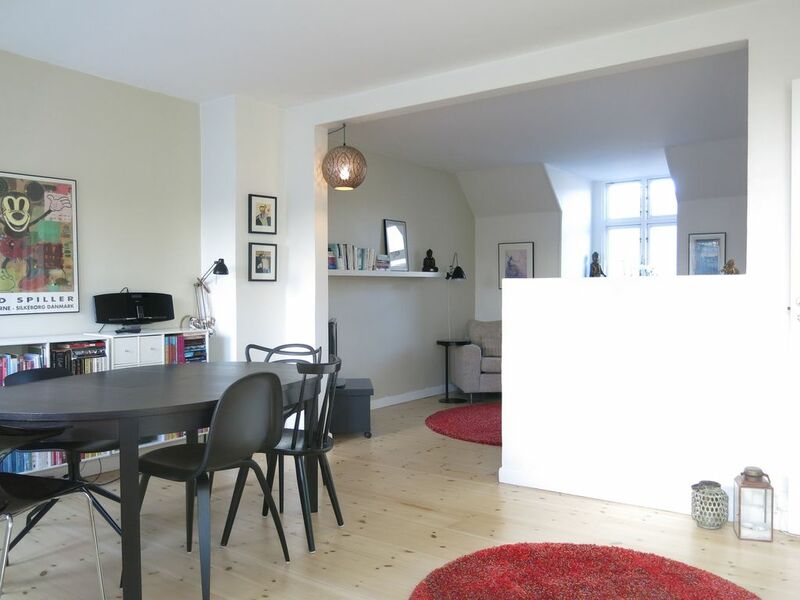 The apartment has a dining area, WiFi, TV with Danish channels, DVD and CD player. From the living room there is an exit to a 12 sq.m. balcony / terrace where meals may be eaten, weather permitting. From the hall there is a door to the bathroom with shower and toilet and an entrance to the well-equipped kitchen. From the kitchen you come to the bedroom. Washing may be done at the nearby laundromat a few minues from the apartment. The apartment is located on the 5th floor of a building without an elevator. + Very nice and clean place close to a park & great balcony! - Being on the last floor under the roof it can be hot. No elevator... can be an issue for a number of people. Beautiful flat. Excellent location. Very friendly and convenient check-in process. Very clean, bright apartment, and the rental company was so easy to deal with. Very helpful and nice! Only negative was carrying luggage up to the 5th floor, but otherwise a really great little space in the city, close to all types of restaurants, conveniences and great places to see.